Call Me Oklahoma! by Miriam Glassman. Holiday House, 2013. Currently available. Face Value: I think it’s clear from this cover image that Paige (aka Oklahoma) is going to be your new favorite character. She’s busting a move on stage in her cowgirl outfit, and she’s entirely adorable. The illustrations that are sprinkled throughout the text are also Glassman’s work. She’s a multitalented woman. The text is delightful, and so are the images of Paige/Oklahoma in her finest moments. Who would we give it to? Do you know any girls in the early elementary grades who get extremely frustrated with the other girls in their class? They will love reading about Paige. Paige is smart and energetic, yet fallible, which will make her incredibly appealing to young readers. Review: Fiction for young readers has its fair share of quirky girl characters. Junie B. Jones and Amber Brown are among the few of the most well-known. Is there room for another perky girl character on middle grade shelves? I think so. This book about Paige Turner has the same highly dramatic, highly emotional content of the Jones and Brown books, but with something special mixed in. Glassman is a master of elementary school humor and dialogue. It’s the excellent writing and character development that make this book a worthwhile addition to home bookshelves and classroom collections. Paige is entering fourth grade, and she’s feeling the push to reinvent herself for the new school year. She’s got some snazzy new clogs, and she needs a new name and a bolder personality to match them. Paige is still reeling from an embarrassing incident at the end of the last school year when she puked during a talent show. Hoping to erase that unflattering moment from her social history, Paige decides to adopt the new moniker “Oklahoma” and bring some cowgirl realness to her fourth grade classroom. Unfortunately, Paige is the type of girl who has big ideas but not quite enough confidence to pull them off. She struts into school ready to tell everyone about her new name. When it’s time for roll call, however, Paige realizes it’s not going to be so easy to get everyone to call her Oklahoma. Her new teacher is very accommodating of Paige’s new identity. But the class bully, ultra cool girl Viveca Frye, is not so flexible. She ridicules Paige for trying to adopt a new identity. Paige is nothing if not persistent. She forges ahead, trying to get her family and friends to call her by her new name. It’s not an easy task. 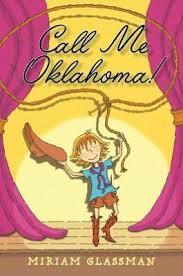 Her parents forget to call her Oklahoma, and her brother calls her a variety of other geographical names. Despite these obstacles, Paige works to create a bolder, more confident persona. It is hard for Paige, because she is often riddled with self-doubt. What makes Paige so lovable is that she is so clearly a fourth grade girl. Glassman has perfectly captured the mix of goofiness and social awkwardness that characterizes that age. Although Paige has a sense of who she wants to be and what is right in the world, she still struggles to make good choices – especially when a chance at popularity becomes available. I also love that Glassman has painted a rich picture of Paige’s home life, as well as the way she interacts at school. We get to know Paige’s family and see how they have played a role in shaping her personality. We also see Paige as a creative individual. She’s a talented pianist, and when she’s frustrated with things at home or at school she creates piano compositions that embody her mood. These passages are written so wonderfully, too. The moments when Paige is creating at the piano are some of my favorites in the book, because it helped me see Paige as a whole person and not just a whacky character. There are laugh-out-loud moments throughout the book. I cracked up when I read Paige’s description of cooked cauliflower as “boiled brain nuggets”. I shook with laughter when Paige had to come home and explain to her mother that instead of buying books at the school book fair, she spent her money on a stuffed monkey. The nonstop hilarity of Paige’s life is one of the best qualities of this book. I think this book is the perfect title to share with young readers at this time of year. In Wisconsin, all public school students return to classes this week. There are plenty of anxious young people out there, hoping to reinvent themselves at the start of a new school year. Call Me Oklahoma! is the book for those worried kids. It will comfort them as they approach the school year, because it demonstrates that you can reinvent yourself if you need to, but it’s also ok to be confident as the same old you. This entry was posted in Middle Grade, Reviews and tagged back to school, elementary school, piano, young readers. Bookmark the permalink.